A giant bubble just popped. I’m talking about the palladium bubble. Palladium is an industrial metal. Its primary use is in catalytic converters – a vehicle part that reduces harmful emissions. 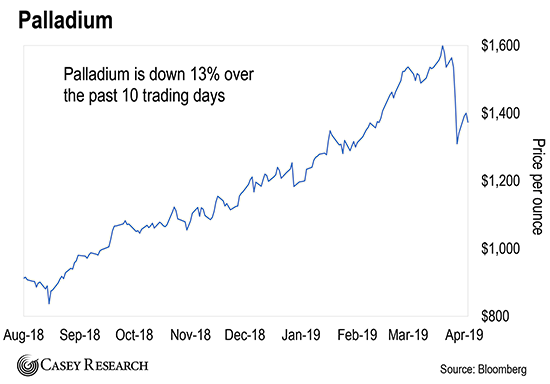 Now, you might be surprised to hear me describe the palladium market as a “bubble.” After all, most commodities have been in bear markets over the last few years. But not palladium. It’s been on fire. That’s double where it traded a year ago… and three times higher than where it was at the start of 2016. That’s an incredible run. And it happened because the global palladium supply is incredibly unstable. Global palladium production is extremely concentrated. Russia produces 40% of all the world’s palladium. It’s the gorilla. There are no other major metals where one country controls that much output. Because of this, a problem in one nation can cripple a huge chunk of worldwide supply. That’s what we’re seeing now. Russia threatened to impose sanctions that would choke off the global palladium supply. That drove prices to record highs. But here’s the thing about bubbles. They eventually pop. You can see that palladium plummeted 13% over the last 10 trading days. That’s a brutal sell-off. After all, we’re talking about a major commodity… not some tiny stock. I’ll tell you the name of that commodity in a minute… and how to take advantage of this opportunity. I’ll also show you why it’s critical to use proper risk management strategies, so that in case this metal does have a fallout like palladium, you could still be sitting on a big win. But first, let me tell you why it pays to listen to Dave. He spent the last 20 years of his career searching for new discoveries and breakthroughs in the resource space. He also founded his own mineral exploration and development companies. To accomplish this, he raised over $80 million from some of North America’s most prominent resource investors. In short, Dave’s a true industry insider. He knows more about commodities than anyone I know (who’s not named Doug Casey, of course). And he says platinum could be the next metal to go on an explosive run. Platinum is a precious metal, like gold and silver. Many people own platinum coins as a store of wealth. Platinum also finds its way into a lot of jewelry. But it’s also an industrial metal. Like palladium, its primary use is in catalytic converters. Now, that’s not to say that platinum is a perfect substitute for palladium. But history has shown that car makers will switch from one metal to another when there’s a significant gap between prices. And right now, platinum is trading at half the price of palladium. That’s a record discount. So don’t be surprised if many car makers opt for platinum over palladium going forward. The platinum market is even more concentrated in terms of supply. About 70% of global production comes from South Africa. South Africa is seeing increasing government take from mining operations as taxes rise. Add that to the fact that South Africa’s mines are generally old and exceptionally deep (up to a few kilometers in some cases) and mining costs here are on the rise – at a time when platinum prices are at a historic low. That means South Africa’s platinum miners are having trouble raising investment while labor unions, the government, etc. are demanding more money. It’s all a powder keg when it comes to a potential massive supply disruption for one of the world’s key metals. In short, there’s a very real possibility that platinum could experience a run similar to what we just saw with palladium. You can easily speculate on platinum by buying the Aberdeen Standard Physical Platinum Shares ETF (PPLT). This fund tracks the price of platinum. For even more upside, consider speculating on platinum miners. These companies are leveraged to the price of platinum. In other words, platinum doesn’t have to rise much for their shares to skyrocket. Just understand that this is a speculation. Mining stocks are volatile. As always, keep your position sizes small… take profits as they come… and most importantly, never bet more money than you can afford to lose. Investors who do this will be able to protect themselves from big drops like we saw above with palladium.